The DG II from the Kverneland range of trailed seed drills offers perfect seeding technology. Decades of engineering experience of the Kverneland Pneumatic Distribution System are built into the new DG II. The Kverneland DG II as the trailed version of the modular seed drill is ideally suited for modern large-scale farm businesses. With working widths of 9 or 12m and a hopper capacity of 6,000 l, its performance is unequalled. Up to 140 ha in one day! The DG II combines high performance technology with maximum ease of use. The machine’s clear layout and the high level of intelligent technology incorporated offer the user maximum ease of use, from set-up and filling, to transport and the seeding operation. The Kverneland DG II guarantees tailor-made seeding operations for all types of crop. Seed placement is optimised regardless of soil quality and the type of cultivation, whilst compaction of the soil is minimised. 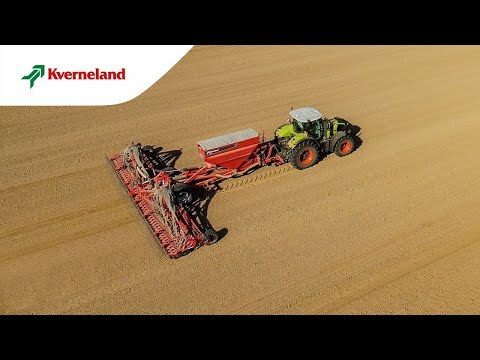 In order to give sufficient support to the 6000l seed hopper and two-section coulter bar, Kverneland developed a sturdy frame design for the DG II that distributes the weight of the machine evenly between the carrier axle and the tractor. The 800/45 x 26.5 wheel equipment ensures safe handling on the road and low pressure on the soil. In the working position the independently mounted toolbars are supported by sensor wheels that ensure accurate tracking and seed depth for the individual coulters during the seeding operation. Powerful hydraulic cylinders guarantee safe conversion from the transport position to the working position and vice versa! The CD mulch seed coulter consists of two steel discs (Ø410mm) with 12.5cm row spacing. Thanks to its very slim design the soil movement is very little, which leads to a smaller need for pressure to achieve the seeding depth. Thus more of the available coulter pressure of up to 80kg can be led to the press wheels when needed. The coulter pressure can be set infinitely. Fully integrated maintenance-free disc bearings provide an easy flow of the coulter. The press wheels (Ø 380mm) are made of special rubber which has a self-cleaning effect. So in most conditions no scrapers are required. The coulter staggering is 175mm. The coulter pressure adjustment is done centrally and can be set infinitely from 0-80kg. The seed depth adjustment is steered centrally via the ISOBUS terminal (series equipment). The two distribution heads are mounted on the coulterbar. With Kverneland's Active-on system, the coulter pressure can be adjusted up to a maximum of 80 kg. The system benefits from the interaction between the coulter pressure and the pressure of the coulter toolbars across the entire width of the machine. Where coulter pressure is high (retracted cylinder), the pressure on the coulter toolbars is increased. This in turn produces a back pressure for the coulters which results in excellent coulter penetration! With the series e-com model, the pressure can be adjusted to between 0 and 90 bar from the control unit located in the tractor cab. The Active-on system actively regulates the coulter pressure with the help of individual pressure sensors thus guaranteeing that the pressure set is maintained in order to ensure the precision and consistency of the sowing depth. In order to reduce the load on the toolbar wheels during turning at the headland, the coulter pressure/coulter bar pressure is always neutralised and then automatically increased again to the pre-set value when the coulter bars are lowered again. Kverneland engages in active, intelligent prevention of wear! Due to the compact design of the Kverneland DG II, this large machine generally requires no special authorization for road transport. With a width of 3 metres and a height of 4 metres, its dimensions are within European traffic regulation standards. The machine’e dimensions also allow it to pass through standard bridges and tunnels. The machine is connected to the tractor via the lower link hitch CAT 3*. The road lights and fixed warning signs are fitted as standard to ensure in combination with the optional dual-circuit air brakes (or hydraulic brake) compliance with traffic regulations and safe movement of the machine on roads. The machine tows exceptionally well due to the sturdy axles and floatation wheel equipment, it can be authorized to be towed at speeds up to 40 km/h. This results in transport and machine preparation times being reduced. The seeding operation becomes faster and more efficient. The machine’s great manoeuvrability and ease of transport ensures that lower lying fields and small pockets of land can also be reached. For safe parking of the machine a sturdy parking leg is fitted. * CAT 3, 3N and 4 N lower link hitches, and a hydraulic braking system are available as options..